Irish people are known the world over for their legendary hospitality but never more so than at Christmas, when the drinks are overflowing and cupboards and fridges are stocked with enough to see out the winter, never mind a couple of weeks. But then you never know who might call so you want to have a little something extra in, just in case. Top of the list would have to be a couple of bottles of Irish whiskey Jameson’s is standard issue in most households for drinking neat. Purists would never ruin it by adding water! Or hot as in hot whiskeys and Irish coffees. And where would be without Baileys? Short of brushing our teeth with the stuff, it’s liberally splashed into every cup of coffee at Christmas as a kind of instant Irish coffee to go with your mince pies. Of course the mince pieces would have to come from the Foods of Athenry, voted the best in Ireland for six years running now. Buttery rich, crumbly short crust pastry with a generous fruit filling with a little alcoholic hint of something, it’s a wonder they only come in sixes. And of course you have to have the Brandy Butter to go with them, and it’s the nuns in Kylemore Abbey, of Irish picture postcard fame, who make the very best after the Mammy! Or a Christmas cake, from Ballymaloe made from only the finest exotic and organic ingredients you would otherwise have to go on an expedition to find. Their cake is baked with that wondrous blend of female culinary talent that has spanned umpteen generations of the Allen family from Myrtle to Darina and current celebrity chef-ess Rachel. Of course Rachel makes the whole process look like a whizz, which it clearly isn’t, believe me. Those cakes are presently maturing nicely ready to be freshly marzipan-ed (almond pasted – the best bit and iced) before being devoured by the devoted. And on that religious note, the monks of Glenstal Abbey have created a true match made in heaven (chocolate and alcohol) in the form of chocolates filled with liqueurs such as Benedictine and Chartreuse from the great abbeys of Europe. A bit further down off the wild Atlantic coast of Kerry is another holy and sacred place the Skelligs Islands which are overlooked by another very special artisan chocolate company Skelligs Chocolate which make the most delicious chocolate truffles probably on the planet. Their collection includes over 60 different varieties including plum pudding, egg nog and hot toddy this time of year. They were also the first to produce a gin and tonic chocolate bar which tastes as good as it sounds. 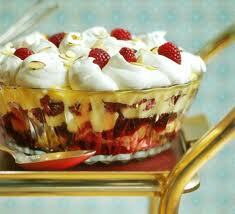 And finally every family in Ireland has their own version of sherry trifle. which is a layered mixture of jelly and sponge with a good drop of the above, topped with tinned fruit (this is about tradition not the healthy option) thick custard and whipped cream with a sprinkling of 100’s and 1000’s of course. And if you don’t know what they are then the whole of the last paragraph was probably lost on you...poor thing. For more information visit www.irelands-hidden-gems.com.